One of the joys of being a comics enthusiast is discovering unexpected character/artist combinations. 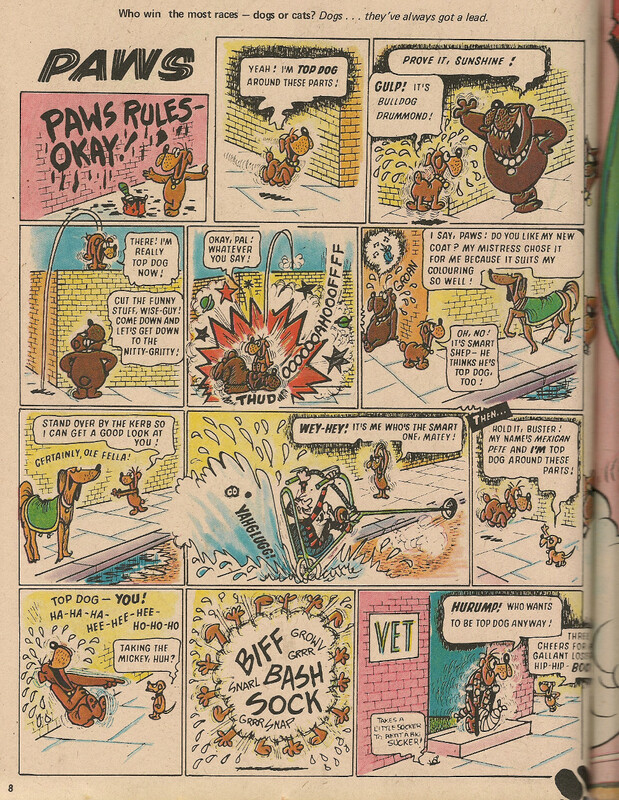 Here's one such - the toothy funster depicted by Styx in an episode of Paws, first published in Krazy dated 23 April 1977. 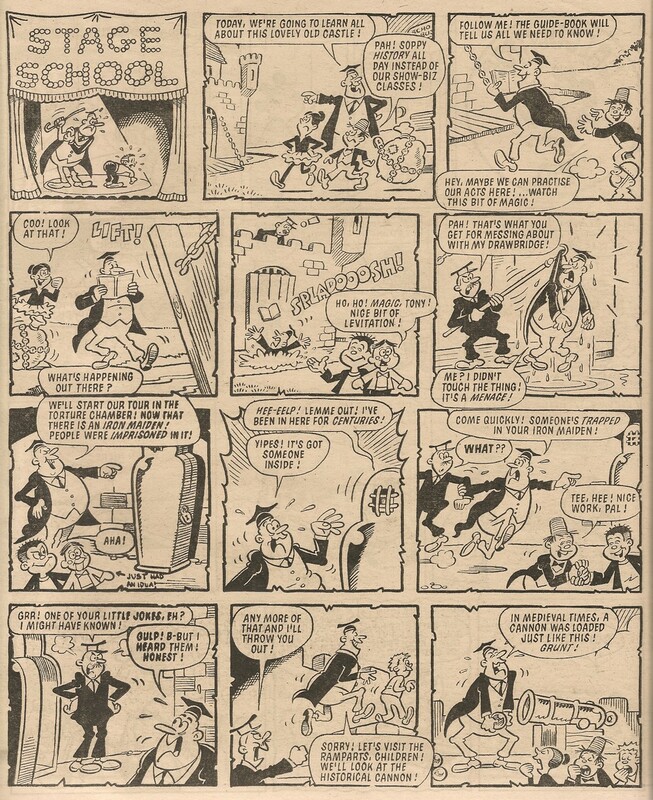 I didn't realise until doing a bit of research just now that Styx was, in the early 1950s, a mentor of Reg Smythe, the creator of Andy Capp. For more examples of Cheeky drawn by non-regular artists, follow this link. 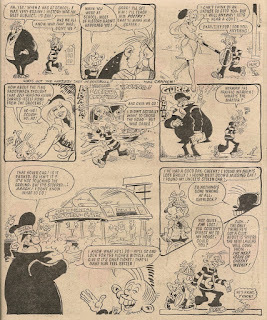 Peter 'Cheeky' Gray has posted Frank McDiarmid's interview in Crikey! magazine from er, actually, what year was it? I know it's volume 2 number 12, Nov/Dec, but I can't find a year in my copy of the issue in question other than a mention of 2009 in the article concerned so I guess that's when it was printed. I think Peter has already posted the interview on his Facebook page, but as I don't exist on that site, nor do I want to, I'm unable to follow his posts there. Facebook, unlike Blogger, doesn't allow people to view content on their site if they're not logged in. 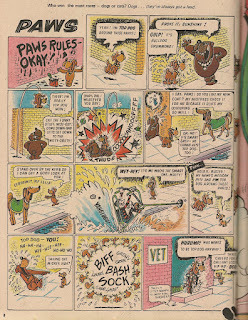 However Peter has kindly reposted a few select items from his Facebook page on his blog. Thanks! 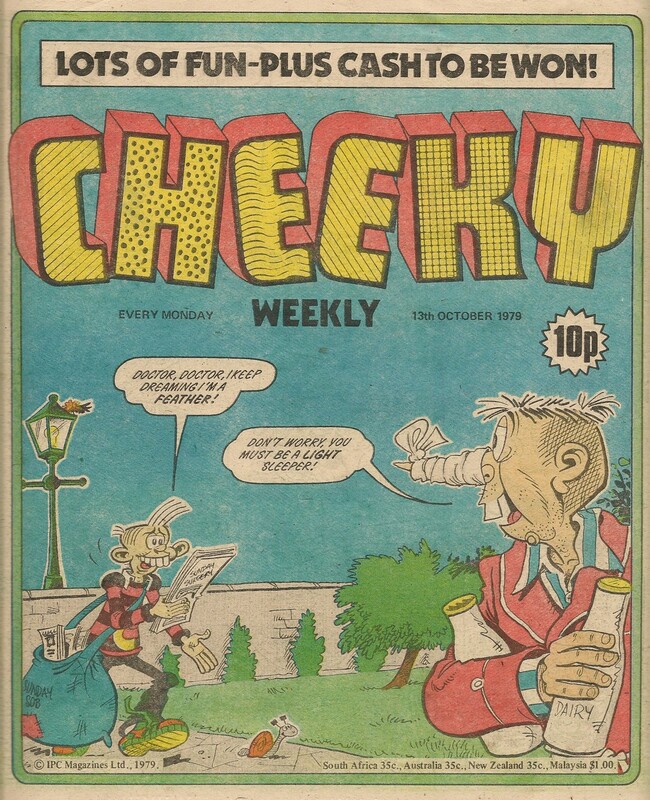 With this issue, Cheeky Weekly's second year of publication is completed, at least in the sense of it being the 52nd week since the first anniversary edition - Cheeky Weekly's second year was of course marred by the loss of 3 issues. 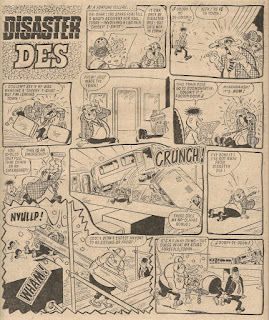 After last week's composite cover it's a relief to see original Frank McDiarmid art again gracing the front page, as Cheeky engages a goldtop-encumbered Doctor Braincell in Sunday morning banter. Barry Glennard depicts the kids of Stage School for the first time, deputising for usual artist Robert Nixon. 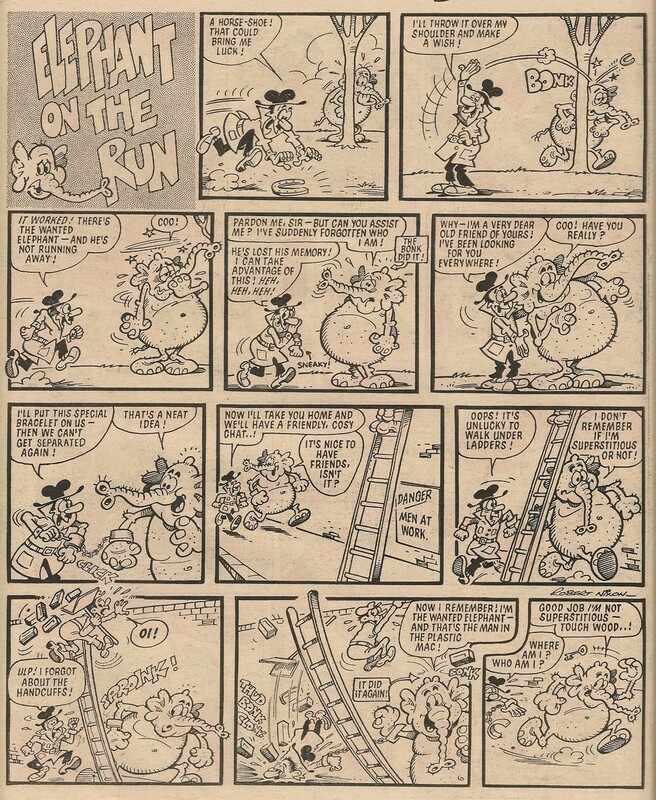 Barry, whose work has appeared in Cheeky Weekly four times before, will provide the Stage School artwork on two further occasions. 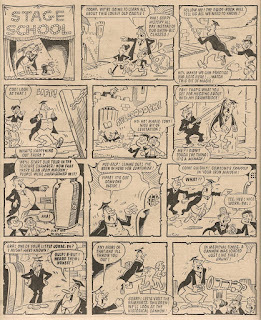 There's further ghosting on the following page, as Nigel Edwards (Tub's regular artist) stands in for Ian Knox on 6 Million Dollar Gran, as he did last week, and on 12 earlier occasions. This week's Gran episode is her first to be reduced to a single page. Elephant on the Run suffers two nasty knocks on the noggin in the course of this week's amnesiac escapade. The first cranial clout causes him to forget that he had hitherto forgotten who he is, yet seemingly without restoring the memory of who he was before he forgot forgetting. Cheeky Weekly's other amnesiac, Mystery Boy, is more successful than our elephant chum in having his memory restored as all ends happily in the final episode of this World War 2 tale. 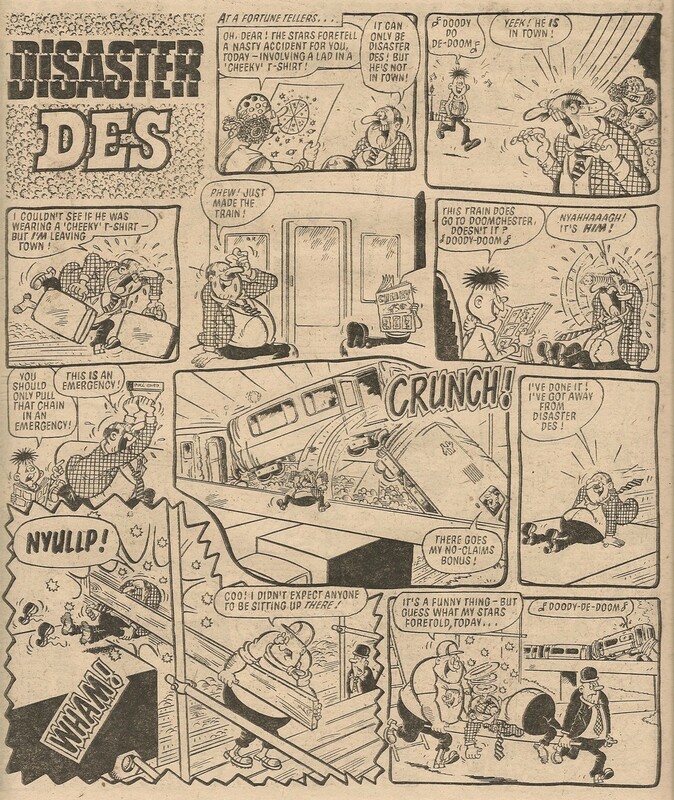 Yet more ghosting is evident on the Disaster Des page as Jimmy Hansen steps in for usual artist Mike Lacey (the only occasion on which Jimmy drew the catastrophe-causing kid). 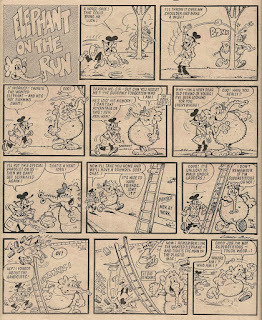 On Saturday Cheeky undertakes no particular pursuit, instead announcing “I fancy a stroll”. During his mirthful meanderings he encounters Lily Pop who seems to be in school crossing guardian mode despite the seats of learning being closed. 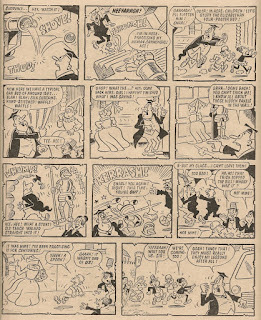 Another instance of ghosting brings the comic to a close, as Barrie Appleby stands in for Frank McDiarmid on Snail of the Century (the first time that Frank hasn't drawn the strip). 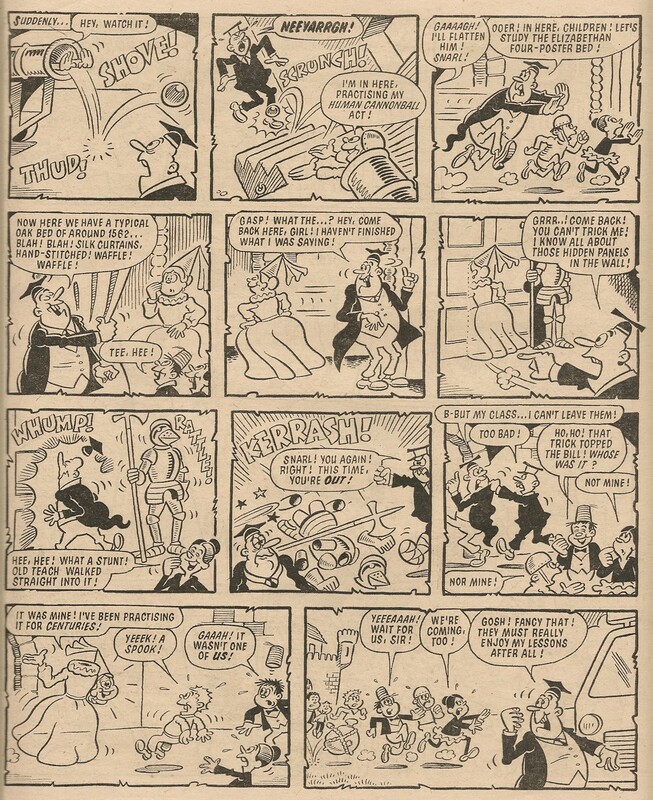 Thus Frank McDiarmid provides 8 of this week's 9 Cheeky's Week elements. 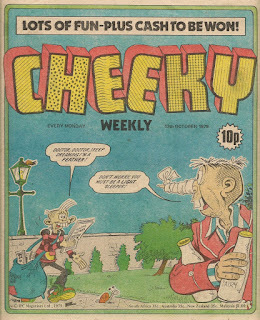 Be back here soon for a look at Cheeky Weekly's 2nd birthday issue!